Fry the sage leaves in some hot olive oil, when crisp remove with slotted spoon and place on some kitchen towel to remove excess oil, season well. Then combine the beans, squash, sage, pumpkin seeds and kale crisps and pour over the dressing. For those that like cheese you could top with feta or soft goats cheese but it is delicious as is! 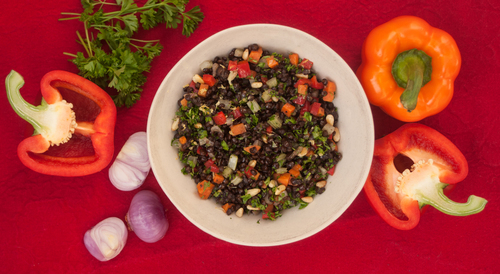 The black beans are powerhouses of nutrition – they are a fantastic source of soluble and insoluble fibre, resistant starch and polyphenols – all fuel for your friendly gut bacteria. A portion of black beans provide 15g protein and are a good source of calcium, magnesium, zinc, as well as B vitamins especially folate. They are very rich in antioxidants. The seasonal squash and pumpkin seeds work brilliantly with fried sage leaves and kale chips in this filling autumnal dish, I’ve added chilli flakes and sesame seeds for extra punch and crunch. Enjoy!